Do you believe in magic? That’s the question the Atlanta Professional Women in Building Council is asking you prior to its first program meeting of 2019! 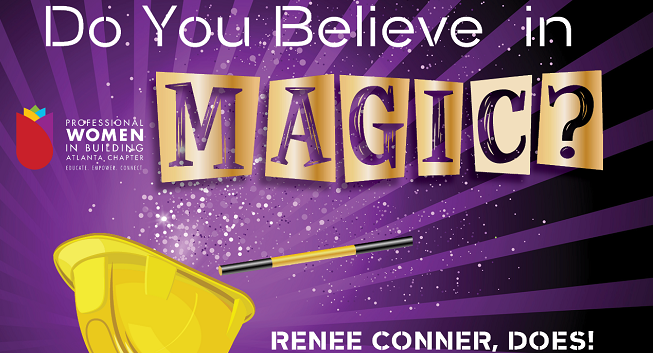 Featuring Renee Conner, founder of Mentoring a Girl in Construction (MAGIC), the program will touch on an increasingly important subject in our industry – women in construction – at the February 13 event. With more than 35 years of experience in the construction industry, Renee will share her journey of launching an organization that aims to introduce high school girls to exciting careers in construction and provide hands-on training in basic construction skills. During the program, you’ll also learn how you can get involved in building the female construction workforce through mentoring, volunteering and sponsorship. This kickoff program meeting will take place at a venue new to PWB meetings – 103 West in Buckhead! Taking place Wednesday, February 13, event registration and networking starts at 11:15 a.m. with the program and lunch starting at noon. Tickets for the event are $40 for PWB members, $50 for non-PWB members and $60 for non-HBA members. To purchase tickets for this event before it sells out, click here. The Atlanta chapter of Professional Women in Building, a council of the Greater Atlanta Home Builder’s Association, brings together the power of professional women and creates opportunities to build success. PWB members work in all aspects of the building industry: owners, builders, developers, remodelers, architects, suppliers, marketing experts, designers, finance and real estate. PWB is the voice of women in the industry, dedicated to promoting industry professionalism and supporting members at the local, state and national levels by offering networking and educational opportunities, legislative awareness and outreach and professional and personal development.